Among the most popular indoor plants, Schefflera are known for their characteristic splayed leaves that resemble a pop up umbrella, earning it the common name of umbrella tree. 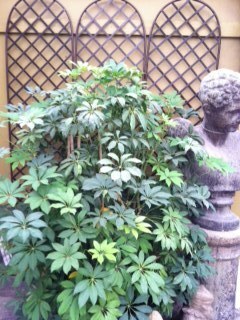 Schefflera are very versatile and can often be found shaped into an elegant little bonsai tree. 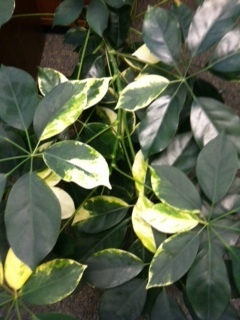 There are variegated (mixed color) varieties, there are large leaf varieties like Amate, and there are smaller leaved varieties like Arboricola. When selecting a space for this lush interior foliage plant, it is best to select a spot that provides moderate natural light. 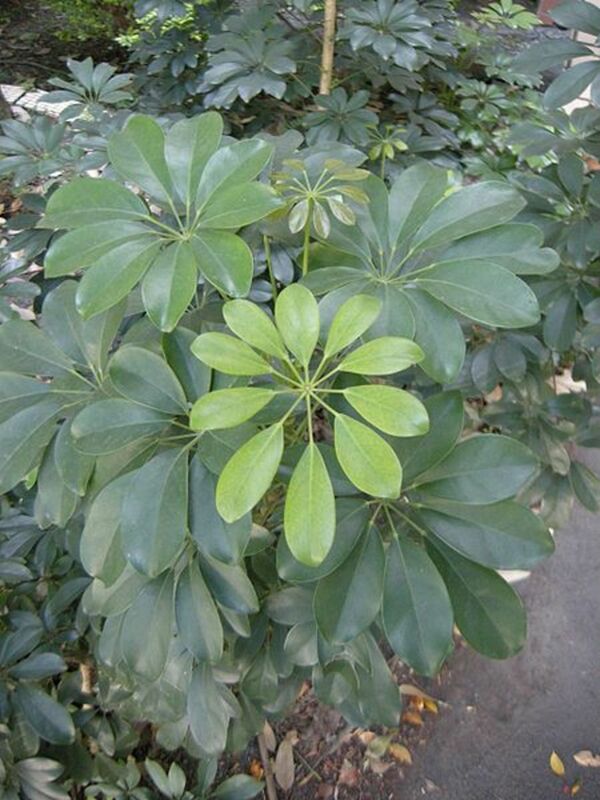 Schefflera with its dense foliage needs a significant amount of light to support and maintain all of those leaves. High light is an option for this plant as well. Be advised that in high light this plant will increase it's water and nutrient usage, and growth will speed up significantly. 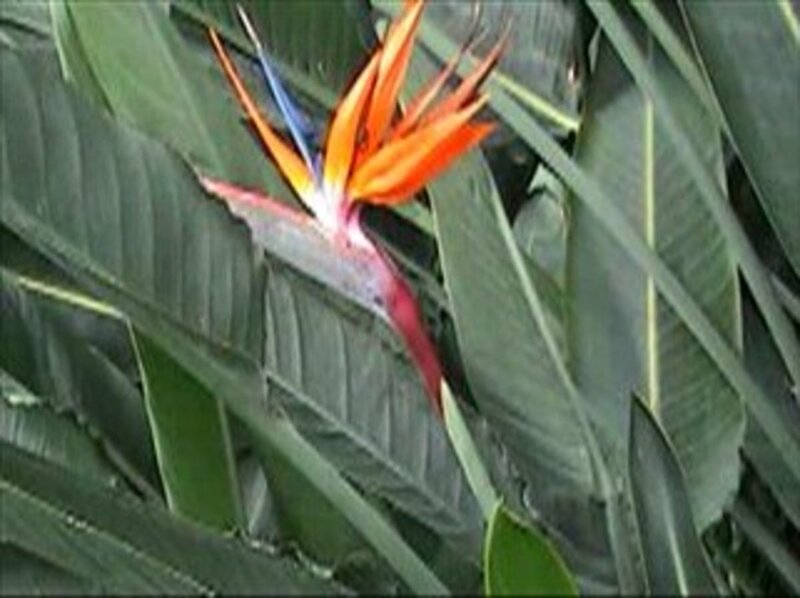 Attention to periodic pruning will be a necessity in high lighting, and replenishment of nutrient will also be needed to avoid creating a chlorotic plant. Consistent artificial light is less desirable for Schefflera, since considerably less benefit is delivered to the plant from light sources such as fluorescents. There is often a significant sluffing off of foliage in such situations and the plant can be left with a leggy looking appearance, often desperately reaching for its light source. Though this lighting environment is not ideal it can still work, but expect reaction for some time until the plant stabilizes. Low light is the is the least desirable situation for Schefflera. In Low light these plants have been known to completely defoliate and ultimately die. An Umbrella tree that begins losing healthy green leaves in mass is most likely signaling that it is not receiving enough light. Watering Scheff is a simple task if you have been mindful in selecting a space for your plant with good lighting conditions. 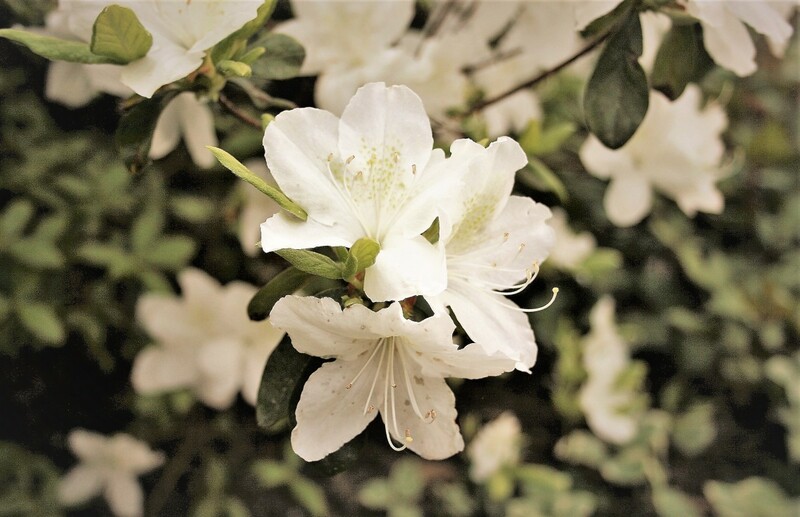 In an ideal moderate natural lighting environment, about once a week, your plant will need enough water to moisten the soil through, without excessive water left in the liner. Watering in this manner should allow for the soil to dry out completely in a weeks time before water is reapplied. If the soil is still wet or considerably moist then wait for it to dry out further before watering again. Keeping the soil too moist for too long can cause over watering damage which shows up in Scheff most often as yellow and green mosaic looking leaves that are still well attached. High light, and or temperatures will increase the productivity of your plant, so in these conditions it is best to water your plant through and leave some excess water in the liner. Allow the soil to dry out completely before watering again. In lower light conditions, or artificial light conditions, the amount of water should be minimal enough to provide some moisture through the soil. It may also be necessary in such conditions to space watering's out two weeks or more depending, making sure that the soil is allowed to dry out thoroughly between watering's. 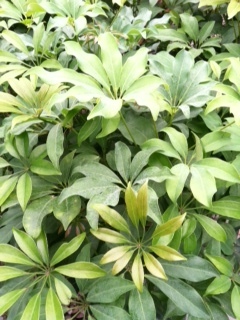 Scale is the number one interior plant pest commonly found on Schefflera. The bi-product of Scale referred to as Honey Dew is most often noticed long before the pesky insect itself is detected. 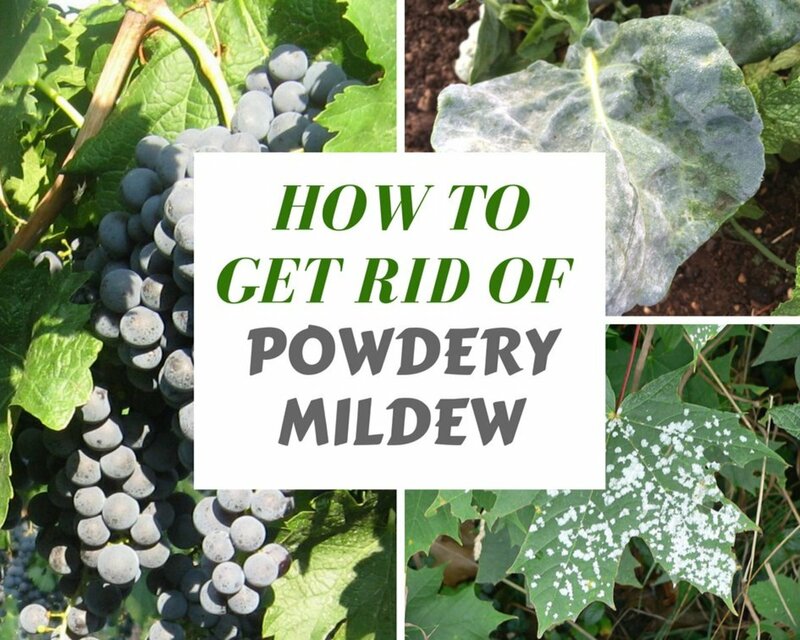 Honey Dew is the excrement of the Scale, and is described as looking like sticky dried residue on plant leaves and the surrounding area, similar to what one would see if a soda had been sprayed on something and left to dry. The insect itself looks much like nothing more than a tiny brown bump on the backs of leaves and stems, it can often be mistaken for being part of the plant. 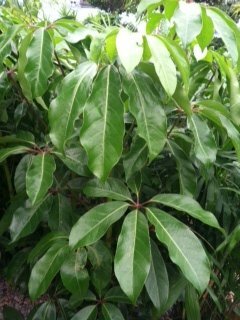 Schefflera should be checked periodically for sign and symptoms of Scale. Treatment can be challenging since schefflera has such dense foliage, it is best to remove as many of the pests as possible by hand wiping. Using a lightly diluted solution of dish soap (1/4 tsp soap to 12 oz water) to both clean, help kill, and coat the leaves of Shefflera is recommended. If the infestation is localized cutting away severely infested areas can be helpful in extinguishing the problem. In sever situations the best choice may be to find systemic pesticide for treating the infestation. Once lighting and watering have been mastered there are some other things to know, that help to keep your Umbrella tree looking spectacular. 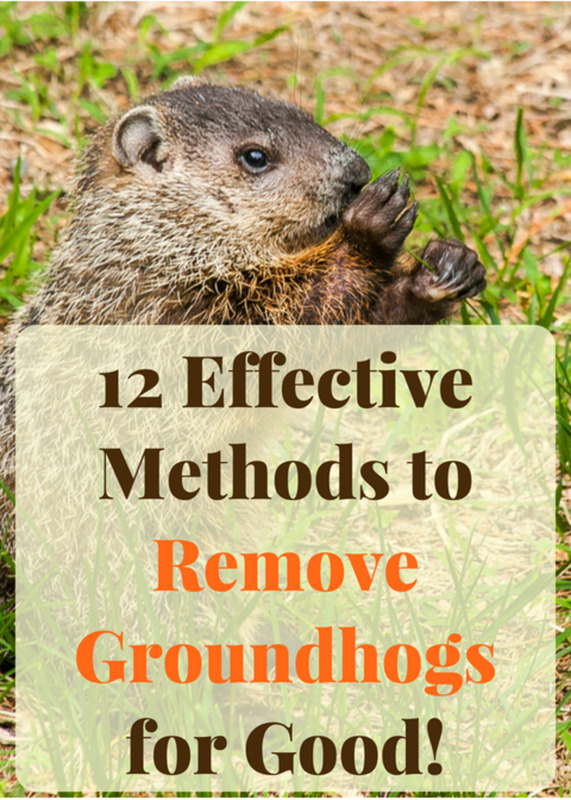 Regularly remove all dead foliage that has fallen down onto the soil surface. Dead organic material is a primary catalyst in developing a fungus gnat problem, this issue along with over watering are sure to create a fabulous habitat for nasty obnoxious little gnats, so keep the soil clear of debris, you will be happy you did. Pruning schefflera from time to time is very healthy. This is a highly active plant so cutting back awkward, leggy, jutting stems back from time to time will keep this plant looking great. Remove yellow, or brown leaves. It is natural for highly active densely foliated plants to looses a few leaves here and there, Scheff can be well done by to get a good shake down every now and then releasing and of those dead stragglers that may have gotten trapped inside. Rotating this plant just like any other helps to keep an aesthetically pleasing shape, and balanced growth. Taking into account these tips and techniques will help you to build a healthy long term relationship with your Schefflera. When should I repot the umbrella plant? Repot if the plant has outgrown its pot or is unstable otherwise it is probably not worth the stress risk that can be created by repoting. Active growing season is the best time of year which is Spring & early summer in most places. Why are the leaves and stems on my umbrella plant turning black? Black or purple leaves or plant stems usually indicate cold damage. Sometimes overwatering, and high humidity can cause mold, mildew, and rot issues that can cause a plant to turn black as well. Why are a lot of leaves falling off? The plant no longer looks full. If the leaves are green that have fallen the two most likely causes are too little light or too much water. If the leaves are yellow or brown that are falling then too little water is likely the problem. Can I cut a stem of my umbrella tree and replant it straight in fresh soil or should I put it in water until it re-roots and THEN plant it in soil? It is best to re-root a Schefflera stem before trying to plant a cutting directly into the soil. What is the best way to grow the Schefflera's roots - putting the root cuttings in water or soil? I believe that Schefflera root better with root hormone and soil; however, I would recommend researching more information specific to Schefflera root cuttings for best results. What insect eats the leaves of Schefflera plants, and how do I kill them? The most common pest infestation found on interior Schefflera plants is Scale. However, the damage done by this pest is not going to show up as visible bites on leaves. If you see actual, visible chunks eaten off the leaves, you might have a larger insect like a grasshopper, or caterpillar which is not very common, but not unheard of, for an interior plant. 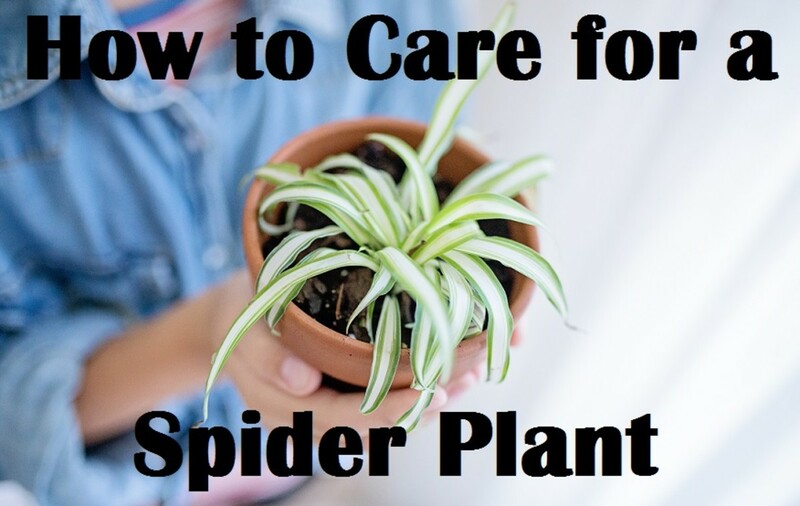 Since the insects I mentioned are larger, you should be able to find it by closely inspecting the plant, and either kill it or put it outside once it is located. I repotted my umbrella tree last year, but since then it's been droopy, and I can't get it back to how it looked before. Do you have any suggestions? Make sure that your Schefflera is in decent light. Using a bit of root stimulating nutrient can be helpful, I like Dr. Q’s plant tonic. If the lighting is good, and the plant has otherwise stabilized and is healthy some strategic pruning can help stimulate it back to life. Thanks so much for wonderful article. I just purchased a rather large version for my office (11 feet tall). I really like it - really transformed the space and is giving back so much to me and my team. The perimeter of the leaves have a "ripple" type look to them. It arrived this way so I'm not alarmed, but wanted to make sure that is not a sign of poor health (water/sun). Anugrah, in reading your description I think that your Scheffleffa may simply be maturing with age. Stems are green on young Shefflera but will gain a harder brown bark like appearance as they age. If you are seeing healthy new foliage growth, but seeing that older leaves are yellowing the plant may just be letting go of older leaves that are now not as productive as the new, out with the old in with the new. It sounds like the watering recommendation is likely accurate for the climate your in, this plant would be extremely active, and moisture would likely evaporate quickly as well. Very frequent watering would be appropriate. Hello I'm from Delhi,India. I hv purchased Schfflera here which is around age of more than 6 years and has very beautiful aerial roots. Gardner there told me to water it on leaves with enough shower. I kept the bonsai under green house and do the same ad per instruction of Gardner. Temperature here is very much hot its near about 46 degree. So I use to sprinkle water almost every evening. Now :-( I noticed that leaves are getting yellow day by day and trunks are getting dark, but the good news is origin of new leaves are also there please suggest me what do. I'm very fond of plants but plz help me out to save this precious bonsai. curiously waiting for your favourable response. 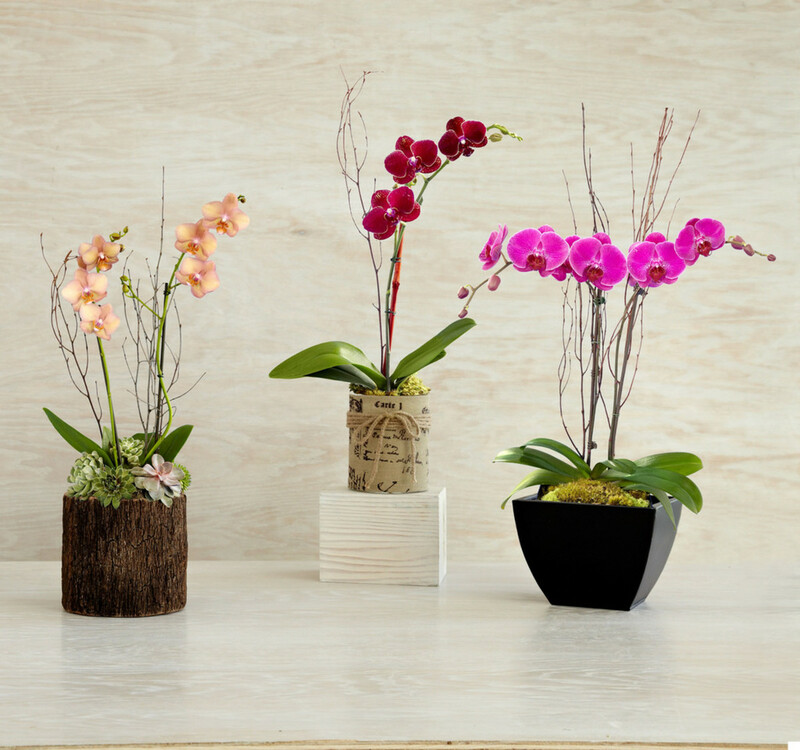 Most indoor plants will have growth changes during winter months, often in the form of a suspension in growth. In most areas the hours of available sunlight decrease during the winter, causing indoor plants to need less foliage to process the light received. Do umbrella plant stop growing during winter months? Mine is about 4 foot high and same wide but have not loss or grown any new leaves in about 4 months.---Thank you ! It is possible to start a new Scheff from a root cutting, however I would highly recommended using rooting powder if you plan on trying this, the stem would likely rot in water alone. I would still give your existing plant a bit more time & closely evaluate the environmental conditions before going down the road of root cuttings which can sometimes be more work than they are worth. The issue described does sound like acclimenting, Schefflera are well known to dump a quite a bit of foliage during this process especially if the lighting conditions have changed dramatically for it from greenhouse, to store, to home. is it possible to save a good steam and let it sit in water till the roots expose .Just wondering in case my umbrella plant doesn't survive. Your Umbrella plant is still fairly new and is most likely adjusting to it's new environment, this can last up to about 2 months. It is not uncommon for a scheff to lose some foliage while acclimenting. If the defoliation is excessive you may want to take a 2nd look at the amount of sunlight and or water, your plant is receiving, a scheff needs moderate (approx 4hrs) to high (6 plus) indoor light conditions. Also allow the soil to become dry to touch before watering again. As per the brown spots these are also not uncommon to Schefflera, but be sure that the spots are not Scale. The spot will be more of a bump, usually on the stem & bottom of leaf, & you may notice sticky residue on the the leaves if scale is present. If this is the case there is a different issue. I always find it fascinating, when I venture to regions far from the dually harsh climate of Utah, to see plants that I know only as houseplants, growing massive and free in the outdoors. Your comment brings me back to how robust plants are in conditions that allow them to thrive, but then remove them from that environment and they become increasingly fragile, and yet survive in spite of it. Thank you for the thought provoking comment Peggy. 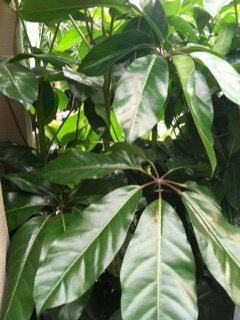 We are fortunate enough to be able to grow Schefflera in the ground outside in the Houston, Texas climate and it thrives. On those occasional frosty winter nights, I just throw an old sheet over it to protect it. If any of the outer leaves get frost-bitten, I just cut them off. Occasional pruning is necessary anyway as you noted. Good hub. Voted useful.